Try your luck on the door by just turning up! What could intrigue me more than an evening in St Etheldreda’s Church near Banbury with Oxford's most exciting new ensemble? The Camerata of Curiosities, recently founded by Andrew Knowles, consists of Jennifer Attia (mezzo soprano), Stephen Sweet (violoncello), and Andrew Knowles (organ and harpsichord), and specializes in presenting some of the most beautiful yet over-looked treasures of the musical repertoire. I expected nothing less than devastatingly exquisite diversions of entertainment – and I was not to be disappointed. The varied programme began by launching straight into an energetic pot-pourri of traditional dances Romanesca e Passamezzo Antico, which included ‘Greensleeves’ and ‘Pastime with Good Company’, for good measure; a perfect choice given the wonderful acoustic of St Etheldreda’s! All three performers unexpectedly ended by singing a trio, providing us with a glimpse of their astonishing versatility. As audience members, this titillated our palettes because the list of composers was mostly obscure and I, for one, was certainly unfamiliar with the likes of Christian Ritter (1645/48 (?) - after 1725 (?)). Andrew Knowles's helpful introductions were both pertinent and entertaining; they added much to the pleasant ambiance and relaxed atmosphere of this professional presentation. His enthusiasm was very evident and captivating. We were then treated to the Pianto della Madonna: Stabat Mater by Italian baroque composer Giovanni Sances (1600–1679), which depicts Mary the mother of Christ almost howling at the foot of the cross. Jennifer Attia captured the spiritual integrity of that unique agony in her stunning interpretation, creating a hauntingly beautiful performance. The dramatic inflections at "Emissit spiritum" were almost like halting speech. 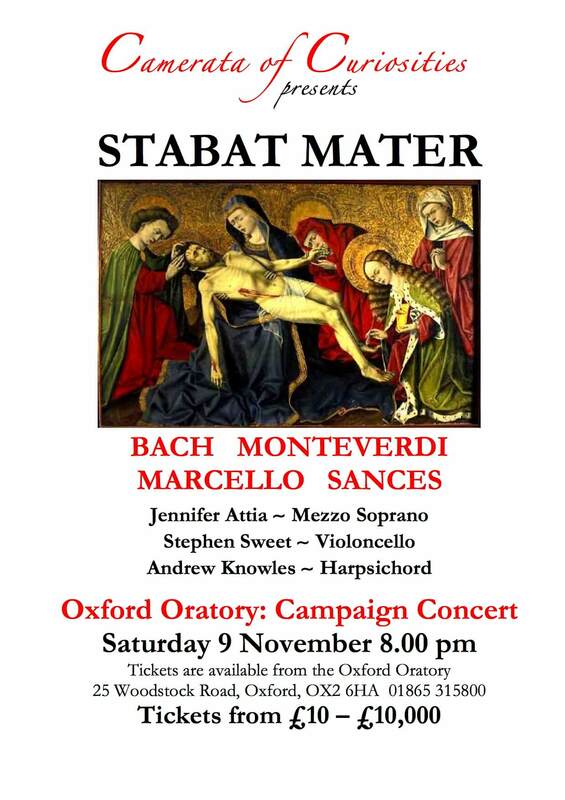 Her renditions of Salve, O Regina by Claudio Monteverdi (1567-1643) and the energetic Cantabo Domino by Alessandro Grandi (1586-1630), the organist of St Mark's, and the aforementioned Christian Ritter's O amantissime sponse proved as affecting. I was won over by her graceful ornamentation and flights of fanciful runs scattered at appropriate points with trilli, tremoli and ribatutte di gola which nevertheless kept beautifully rhythmic. This was intelligent singing of the highest calibre. The audience certainly appreciated her gift for communication, beautiful tone, and sustaining power. Jennifer Attia was ably accompanied by the continuo (cello and either harpsichord or organ), although arguably the bass line could have been more prominent at times. The organ was tuned to A=447, and this meant that the harpsichord also needed to be tuned up to this pitch; the intonation was occasionally temperamental (pun intended), but these are minor quibbles. The seating in the nave of the church was turned to face the west door because the organ is situated at this end of the church; I liked this seating arrangement as one felt included in their chamber music-making. The Praeludium in G from Johann Sebastian Bach’s unaccompanied cello Suite BWV 1007 was played with a sense of majestic commitment and style. I also enjoyed Stephen Sweet's performance of Le Cygne from the Carnival of Animals by Saint-Saëns – an intriguing choice in that this was coupled with Jacques Arcadelt's (ca. 1507-1568) Il bianco e dolce cigno and, inevitably, The silver swan by Oxford composer Orlando Gibbons (1583-1625), the four parts of this familiar madrigal covered by the two instruments and solo voice. The eighteenth century domestic chamber organ was given by Pinwell c.1872, shortly before his retirement. It was restored in 1967 in memory of Commander O. Piggott, and given electric bellows. According to an inscription on one of the pipes, the organ was built in 1765 by John Irvine, a little-known London organ builder. Andrew Knowles discovered its potential beauties as a recital instrument whilst accompanying a performance of John Stainer's Crucifixion on Good Friday 2013. Unfortunately, the story that Handel possibly played on the instrument in relation to his employment at Cannons (the seat of his patron, the 1st Duke of Chandos) from August 1717 until February 1719 is apocryphal. Nevertheless, at the end of Handel's stay at Cannons, the Duke and his friends famously helped him establish a new opera company in London - the Royal Academy of Music. Andrew Knowles certainly displayed the organ’s virtuosic capabilities when he put the instrument through its paces in Bach's Duetto IV (BWV 805), which was intimate and yet contrapuntally complex with cordons of chromaticism - Knowles made God's ineffability sound effortless. I was particularly intrigued by his own Voluntary in D, made up of different works by John Stanley (1712-1786). This showed off the organ's various stops, such as the cornet and the trumpet, including a piano - forte echo effect operated by two foot pedals. The organ had obviously been lovingly restored, but not changed, which rendered the performance all the more fascinating. We ended the official programme with Charles Gounod's famous Ave Maria but with an added frisson. There is a 1904 recording which has a late nineteenth-century violin descant added as a countermelody. Andrew Knowles had transposed this down an octave for Stephen Sweet to play – a highly effective arrangement. We were finally sent on our way with a shamelessly hilarious performance of Rossini's Il duetto buffo di due gatti, with a Persian kitten and Ginger Tom accompanied by the versatile Stephen Sweet on keyboard. Absolutely fantastic! 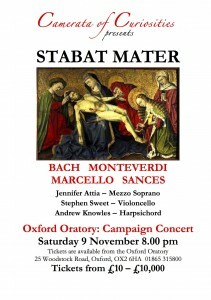 The beautifully-designed programme of musical rarities announced that the Camerata of Curiosities was to present Stabat Mater and, below a picture of the Pietà, listed the featured composers as Bach, Monteverdi, Handel and Sances. In the event, Andrew Knowles chose to replace the originally planned Handel Suite VII in g minor with the Stanley Voluntary, and this explains the mysterious absence of the former from the programme. Jennifer Attia's voice is ideally suited to Handelian oratorios and operas and I would have welcomed a burst of an aria or two during the course of this delightful evening - even though that might not have fitted the bill as a curiosity. Perhaps next time?